It’s really simple. All you need is Hand tool. Activate Hand tool (H) / hold Space bar or Alt/Opt while in text. With Hand tool active, click and hold down the mouse button. 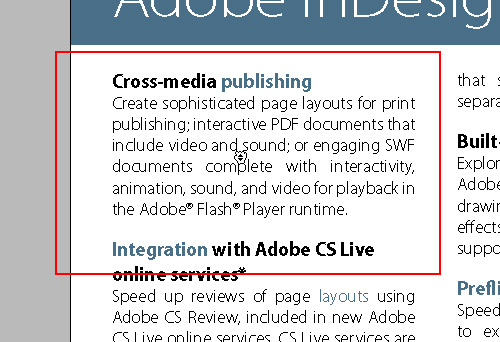 While still holding mouse button, drag mouse (red box) to scroll through document. Release the mouse button to zoom in to the new selected area. This will give you more control while scrolling through your document. Also, you will work faster, because you don’t have to zoom-out then zoom back in. This entry was posted on Tuesday, January 4th, 2011 at 11:40	and tagged with InDesign CS4, InDesign CS5, zoom and posted in InDesign. You can follow any responses to this entry through the RSS 2.0 feed. Drago mi je sto ti se svidjaju blogovi! Relativno su novi, IndiSnip 5 meseci, a IndiTip ni nedelju dana, ali vec postoji velika zainteresovanost! 😀 Takodje, veoma dugo koristim InDesign, ali skoro svaki dan nadjem nesto novo… 🙂 Ako si zainteresovan za saradnju, slobodno me kontaktiraj putem emaila.